Breathe a bit of coastal charm into the everyday with these one-of-a-kind handmade strikers. Some people become accountants, others teachers, but Jeff Henderson was called to his profession by something the rest of us have probably walked right past: Rocks. He sources these naturally rounded, one-of-a-kind stones from coastal New England, and breathes new purpose into them, like with his stunning match striker. Swipe a strike-anywhere match against the coastal accent to light your favorite candle or to start a cozy fire. It makes a thoughtful gift for sea-craving friends and anyone you know who'd rather be at the beach. Handmade in Maine. Read the reviews - that this was only for strike anywhere matches. Haven't had a chance to test those to see if this works at all, but have tested another 4-5 kinds that we had in the house and none of them work. Disappointing. The strikers on the paper boxes that wooden matches typically come in just never outlast the matches. Especially true in damp environments like bathrooms. This product serves a useful purpose and doesn't look too bad doing it. I like it, but it takes 2 or 3 strikes to light the match. It almost seems like it should be a rougher surface. At this, point I would still recommend it - I just hope the surface doesn't get more dull over time. 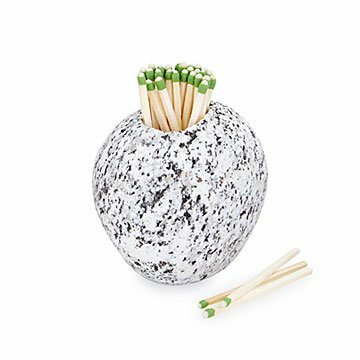 It's a cute design but if it doesn't light itself, who the heck needs a rock that just holds matches? After having multiple people try 4 different kinds of matches, I just gave up. I read some of the negative reviews and bought it anyway. It is exactly what it says it is and looks exactly as pictured. "Strike Anywhere" matches work perfectly. Previous buyers who had trouble may have purchased "Strike on Box" matches. The packaging is similar, so read the label. Also, don't complain about it not coming with matches. It says it doesn't and it's illegal to ship them. You just strike the match on the stone and then light the candle. The stone holds matches as well and looks great on the coffee table. doesn't work at all. Won't light a single match. Lousey purchase . Don't buy this! It doesn't work!